The Bentley Bentayga has confronted and batted away criticism from its earliest inception, and here’s another hurdle for it to clear: the arrival of a diesel engine, Bentley’s first. It raises all sorts of questions, chiefly over whether a diesel can ever deliver the kind driveability and refinement that befits the brand. Those are qualities that have served Bentley well for 97 years, lest anyone be in any doubt about the kind of heritage that’s being toyed with. Needless to say, this being a Bentley, it’s no ordinary diesel, although it is one co-developed with Audi. It’s a triple-charged 4.0-litre V8, which uses two twin-scroll turbochargers supplemented by an electrically driven supercharger, and it weighs 3kg more than the flagship twin-turbo 6.0-litre W12 petrol engine. As in the Audi SQ7, the V8 develops 429bhp and - crucially - the same peak torque as the W12. However, the diesel’s 664lb ft extends from just 1000rpm to 3250rpm, helping to fire the car from 0-62mph in 4.8sec and on to 168mph. Between 25mph and 75mph it is pretty much on a par with that W12, too. 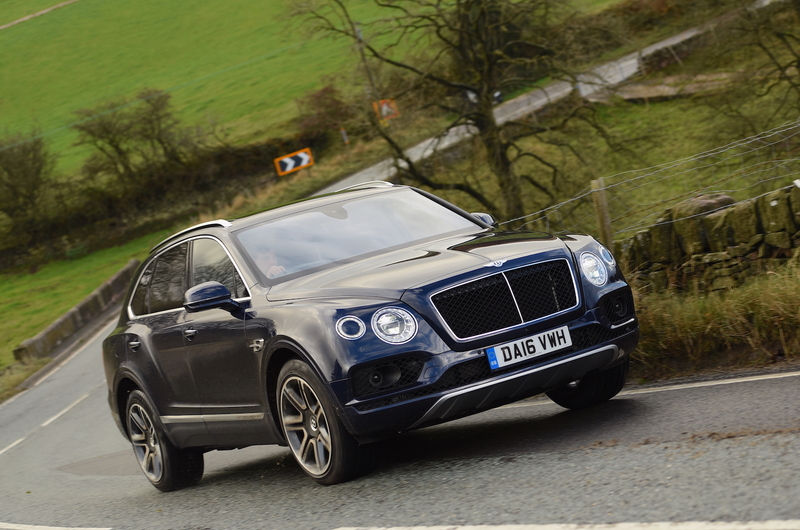 It is, says Bentley, the fastest diesel SUV in the world. Fuel economy is officially 35.8mpg combined and its CO2 emissions are 210g/km. Bentley officials are keen to point out that this is a powertrain born of opportunity, not necessity; they would never have launched it had the appropriate technology not been developed first, they say. The key breakthroughs are the engine’s triple-charging system, the 48V supplementary electrical system used to power the electric supercharger and a sophisticated exhaust cleansing system. The triple-charging system provides boost at low revs from the near-instantly reacting electric supercharger, called an e-booster. Powered by the 48V electrics, it primes the first of two twin-scroll turbochargers. This first turbo amplifies midrange thrust, then a second twin-scroll turbo provides extra shove at mid to high revs. The effectiveness of the e-booster is heightened by a valve shut-off system, whereby an exhaust valve disengages to provide faster combustion pressure build-up. The exhaust gases are cleansed by a selective catalytic reduction system, an AdBlue urea fuel supplement and an additional catalyst. If you’re eagle-eyed you’ll be able to spot a Bentayga diesel because it has a black radiator mesh, twin quad exhausts and discreet badging. Other than the engine and ancillaries (including the exhaust system), physical changes are few and far between and largely focus on minor tuning of the suspension, necessary because of the weight distribution shift as a result of the addition of a 23-litre AdBlue tank. 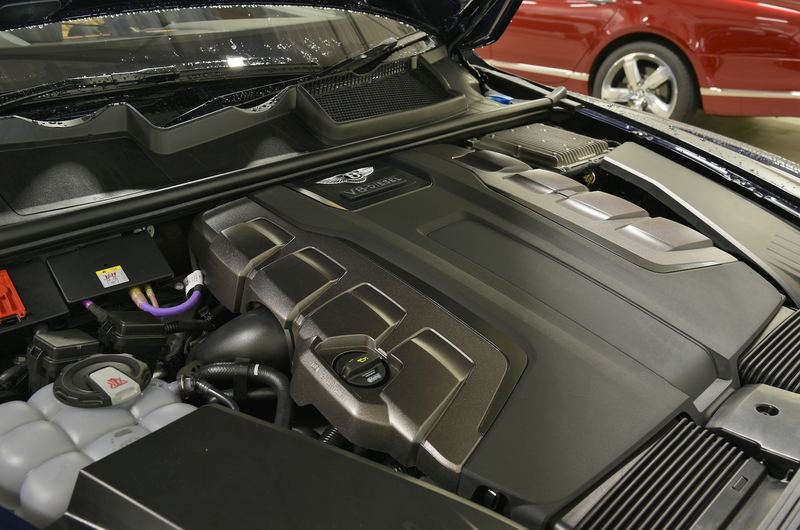 Bentley even claims that, as the Bentayga was engineered with this engine in mind, it hasn’t required significant acoustic work to block out any unwanted thrum. The paragraph above is pertinent because, even if you try to provoke it by holding the revs as long as you can, or even by giving the throttle a bootful in neutral, there’s really very little to tell you that there’s a diesel under the bonnet. Standing next to the Bentayga as it ticks over at rest, you might guess the powertrain; on the move, what thrum there is is actually quite appealing. What all that technology and deep engineering skill has done is pretty much disguise the potential negatives of a diesel and leave the way clear for you to get on with enjoying the benefits: chiefly a silky torque delivery that should be celebrated for how it pulls such a large car along so effortlessly. It's a marked contrast to the manner in which the aforementioned SQ7 drives, too: the Bentley makes the Audi feel like a rather blunt - if appealingly sporty - instrument in comparison, which is a credit to the work of Bentley's engineers on and around the powertrain's settings and ancillaries. Really, for most owners most of the time, all that is required is to engage the smooth eight-speed automatic gearbox and let it make light work of hauling along this 2.5-tonne car. The revs rarely build beyond peak delivery at just over 3000rpm, and progress is both swift and refined. If you must, you can engage Sport mode and stretch the revs to close to 5000rpm, but the extra thrust hardly seems necessary - although it remains appealingly smooth and progressive - and the impact on the cabin acoustics is both slight and inoffensive. As befits a Bentley, impressive performance is delivered in a very civil, discreet manner. Over our varied test route in Spain the trip computer claimed 26.5mpg, and while that's hardly a scientific means of measurement, it is a fair improvement over the W12 and a reasonable indication that the theoretical range of 621 miles could comfortably be a reality of around 500 miles, which is surely enough for chauffeured drivers never to see a fuel station or for cross-continental travellers not to be forced to stop too often. Everything else is the Bentley Bentayga as we know it, so it's luxurious, spacious, well appointed and, above all, just so, and it bears repeating that it has already seen off the Range Rover in an Autocar group test and been awarded four and a half stars in our road test, albeit both in petrol form. There are arguments that the two-car test might be closer in a diesel versus diesel battle, but that would be entirely down to the Range Rover diesel being so clearly in its sweet spot, not because of any shortcomings with the Bentley powertrain. Niggles - and that is all they are - are few and far between. There’s little sense of connection with the road through the tyres or steering wheel, the ride on large bumps at low speeds could be slightly better and perhaps there are rather more driving modes than anyone will ever use (Snow, Sand or Wet Grass modes, anyone? ), but perhaps that is to prove the point that if you need assistance, it is there. 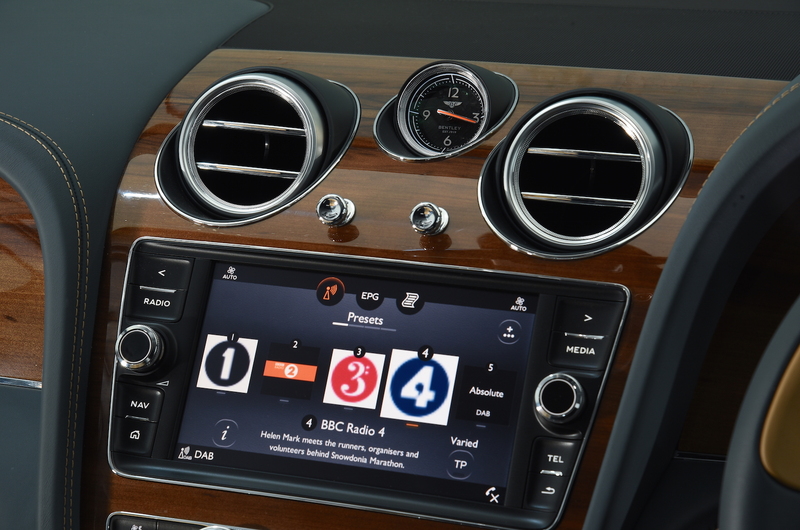 The infotainment system is as close as the interior gets to being disappointing, chiefly because Audi’s latest tech is easier to use and looks more modern, but Bentley may reasonably claim that its customers are more traditional. Overall, to find faults you have to be very picky indeed. That the Bentayga is a hugely accomplished car wasn’t in doubt - and now nor is the fact that a diesel engine can be entirely appropriate for it. Versatile, luxurious and oh so effortlessly grown-up, this is a special car that is close to being complete and which misses the full five stars by only a whisker on this first acquaintance. Unless you need the W12’s blistering pace beyond 100mph, live in a country where diesel is hard to find, or have long-term concerns with diesel emissions and their impact, this is the Bentayga for you. Matters such as a lower list price - by £24,400, no less - and lower (if not actually low) running costs will seem like trivialities to the many buyers who have already kept the order books full for many months ahead. But many of the super-rich are also super-rational, to the extent that Bentley is even expecting to attract buyers via lease deals that will be underpinned by demand-led residuals that make monthly payments rather lower than you would otherwise expect. It’s a rarified atmosphere in which to be buying, of course, but then here is a car that more than justifies its place up there. Location Spain; On sale Now; Price From £135,800; Engine V8, 3956cc, twin-turbo diesel with electric compressor; Power 429bhp at 3750rpm; Torque 664lb ft at 1000rpm; Gearbox 8-spd auto; Kerb weight 2390kg; 0-62mph 4.8sec; Top speed 168mph; Economy 35.8mpg (combined); CO2/tax band 210g/km, 37%; Rivals Range Rover, Audi SQ7. This appliance neatly encapsulates everything that is wrong with the modern automotive industry and marketing led business. Nonsense. It's a car that appeals to the market hence why it's selling so very well. In doing so it secures thousands of jobs through the supply chain and keeps the British motor industry not just afloat, but in very rude health. Good job you aren't in charge. Were you referring to your comment or the car? Since when have you been appointed as judge of good taste? The best thing about the car industry for potential buyers is the huge choice they give us to buy a varied lot of cars to suit our personal tastes. Whilst the interior, butternut, in the pictures would not be my choice of internal colour the car itself is very desirable as indicated by the long waiting lists for buyers. I always wonder what drives some commentators to actually want to prevent others from having the ability to choose what they want, after all I could not care less what your choice of car is and have no desire to restrict your choice either. You and Rear are right. As an automotive and driving enthusiast I applaud the current proliferation of tall, heavy wagons that look like they have off road capability but do not. I stand corrected, and apologise for daring to voice my opinion in this medium for the expression and communication of personal opinions. As you were! Where do you get the idea that this car and other similar cars, Range Rover Sport, Q7, etc have little off road capability when many reviews show otherwise? I would agree though that most owners will not use them off road they buy them because they want them for their height, good visability, ability to ignore speed humps and potholes. People also buy them for the same reason they buy sports cars, not to drive beyond speed limits or to race but to display their wealth and enjoy their wealth just as they buy expensive watches, houses, clothes, etc. It is called free choice, would you prefer we were all given a short list of what we were to be allowed to buy dictated by some state body, like the Soviet system? Could we have a choice of a few hatchbacks limited to 70 mph and a maximum of 40 hp, after all that is all we actually need. Personally I will not be buying a car like this because I cannot afford to nor the running costs but I believe in personal freedom to buy what you want and not be dictated to by others who disagree with your choice. Very well written and coherently communicated. Thanks.